He would still rather not use swords. He has his reasons. GO SKEARVA!! FIGHT THAT SEAWEED! Lorelei, those swords are individually bigger than you are. How are you even holding them. Villains have to be multi-talented. You never know when the hero is going to try and beat you at tennis, or go-karts, or golf. Derk doesn’t have a sword still! Lorelei, throw one of yours at him! I love watching Skarva be badass, even if it’s just towards seaweed. Slice! I’ve missed you! And look, you’re doing something amazing here! Lorelei has crazy powerful little girl muscles…. And Slice finally got rid of that silly fish costume! One lesson is all you need to know how to slice-n-dice like Skarva. One lesson? Is this referring to Blank showing him what for? Woah, Skärva, what happened to your leg? Well, one is his knee and the other is his calf, but I see what you mean. They are getting a little high up! And his calves should go lower, now that I think about it. I’ll work on it, thanks. One lesson’s better than none! What about both? Maybe I want the figure to shoot magic while holding swords. I suppose you can still have one hand in magic blast position and only swap one out to holding a sword. OoOoh Skärva’s acting all swashbuckling n stuff. Cool. PS I love how Lorelei’s bandana has a bow at the back. Just noticed that. It’s good enough for seaweed! Apparently. Maybe it wouldn’t have actually been able to give anyone a deadly cut… but then they would have died from lockjaw. …Why am I fangirling over a shark with a piece of pointy metal? Heck he would make a great pirate mage. He can fight with sword and shoot people with magic. And he is a natural at it. 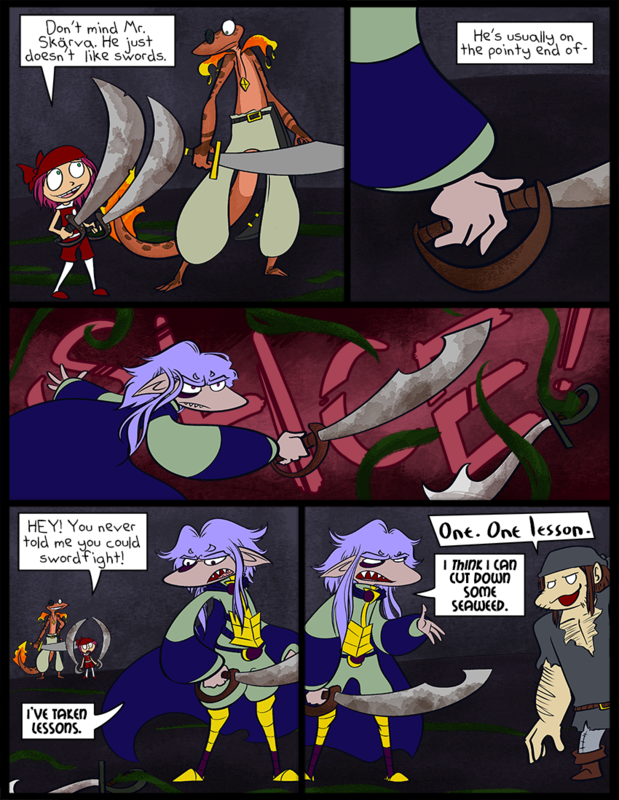 Shark face, cheating, and being great with a sword with only ONE lesson… maybe he should use a sword against the hero for a change of pace. Does anyone have a list of the very few times Skarva was a badass?